While it may seem simple enough, the term “superheroine” is actually a rather ambiguous one. There’s a very thin line between the superhero genre and sci-fi and fantasy. Not all superheroes have alter egos, superpowers, and a colorful costume. That’s why it’s difficult to denote the first true superheroine in comics. Instead, I’ve decided to highlight a few of the characters most likely to merit the recognition as the first superheroine in comics. 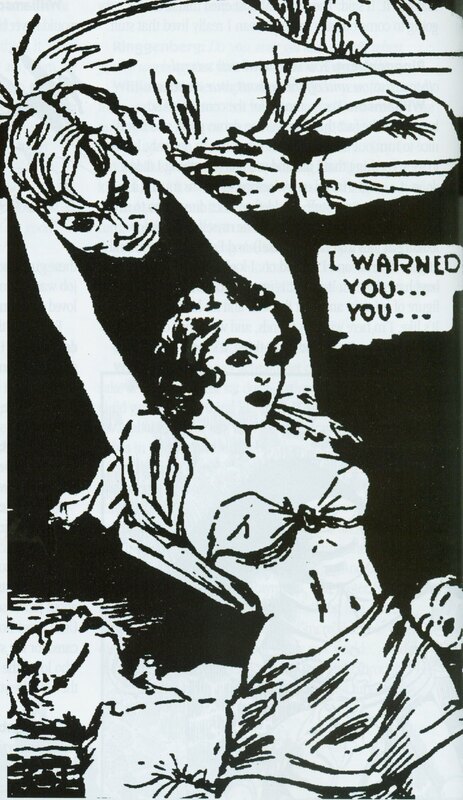 Olga Mesmer first appeared in a featured titled “The Astounding Adventures of Olga Mesmer, the Girl with the X-Ray Eyes,” in the August 1937 edition of the pulp magazine Spicy Mystery Stories published by Culture Publications. This debut predates Superman’s first appearance in Action Comics #1 (June 1937) by ten month. So not only is Olga arguably the first superheroine in comics, but also the first superhero. In the feature, Olga wields superhuman strength and x-ray vision due to experiments performed on her mother by her mad scientist father. She eventually discovers that her mother was actually from Venus and travels to the planet and ends an interplanetary war. It’s hard to say whether Olga is a superheroine or just a sci-fi heroine. She doesn’t wear a mask or costume, but she does have superpowers, an origin story, and she engages in heroic feats. However, if you accept that the superhero genre started with Superman, then characters that predate him can’t truly belong in the genre. 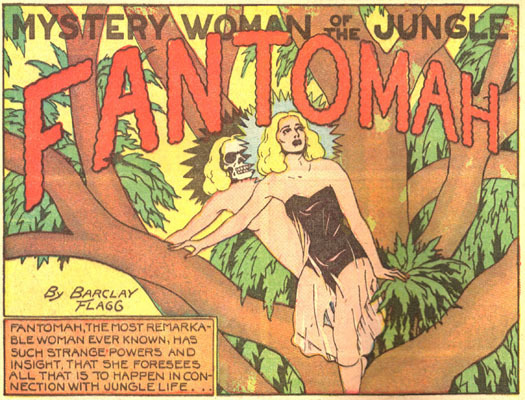 Fantomah made her debut in February 1940 in Jungle Comics #2 published by Fiction House. Despite being blonde and white, Fantomah is presented as the mystical protector of the African jungle. Like Sheena (who also appeared in Jungle Comics), the argument can be made that Fantomah is more of a “Jungle Girl” than a true superheroine. However, unlike most of the other “Jungle Girls,” Fantomah does have superpowers. Her ill-defined power set includes the ability to fly, teleport, levitate objects, turn giant spiders into normal sized spiders, and do just about anything else the situation calls for. She doesn’t wear a costume, but her face does transform into a blue skull when she uses her powers. 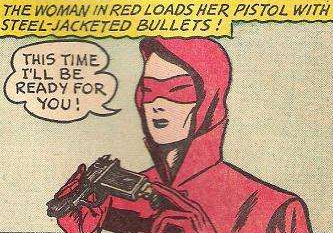 The Woman in Red first appeared in a March 1940 feature in Thrilling Comics # 2 published by Standard Comics under their Nedor Comics imprint. She may not have any superpowers but unlike some of the other ladies on the list, the Woman in Red is the first comic heroine with a solely “superheroine” feel. Peggy Allan is a police officer who decides to create a costumed persona for herself after becoming frustrated by the limitations of her badge. 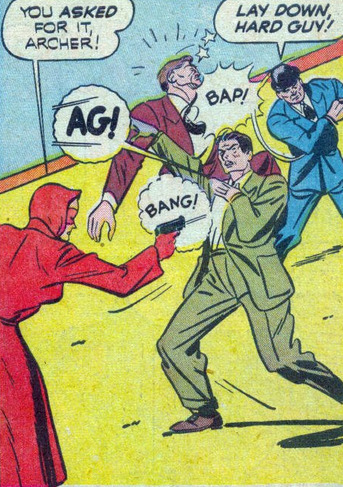 As the Woman in Red, Peggy fights crime and is an excellent detective. She’s kind of like a gun-toting Batman. She’s also notable for the fact that her character is free from much of the objectification that plague other heroines of her time. Her costume actually covers and de-emphasis certain anatomical features that many other heroines’ costumes are designed to emphasis. Comment and let me know which character you think merits the recognition of being the first superheroine in comics! 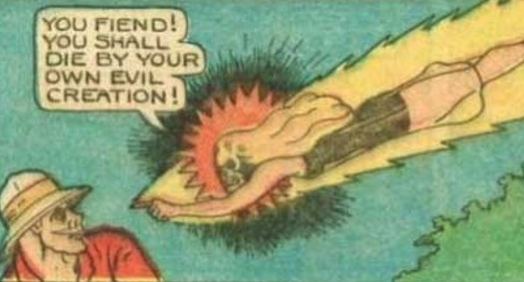 And please join me next Monday when I’ll discuss the Red Tornado, the first crossdressing superheroine. Big fan of Woman in Red, but Olga Mesmer may take the title… I’m not sure if being a superheroine necessitates wearing a costume, and Olga does have superpowers. Thanks for the post! Thanks, I’m glad you liked it. I’m a little partial to the Woman in Red myself. Regardless, I’ve written articles about Fantoma already. I am writing a blog post now about Olga, and I might get around to the Lady in Red soon. I thank you for confirming some of my own research. I can’t believe I’ve never heard of Vana before. She seems really interesting. Thanks so much for sharing! Great post! I’m really fascinated by pre-Wonder Woman female superheroes. I frequently blog about my favorite of the bunch, Lady Satan. She’s not really a superhero, but she’s got some of the tropes, including the spandex, the chest emblem, the cool name and the cape, and though she starts out as a thief she fights crime later. She’s kinda like a female Robin Hood crossed with Zorro. Thanks! I know Lady Satan but I wasn’t familiar with the rest. “The Lightning Raider” is especially interesting. Thanks for sharing!